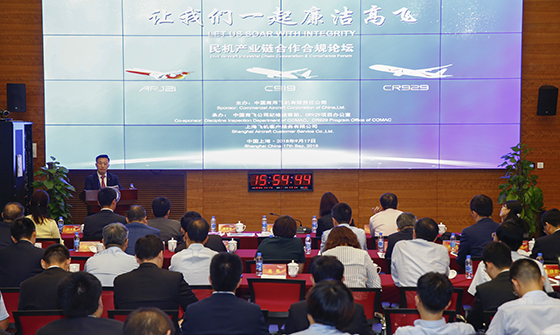 Civil Aircraft Industrial Chain Cooperation & Compliance Forum held in COMAC__Commercial Aircraft Corporation of China, Ltd.
A Civil Aircraft Industrial Chain Cooperation & Compliance Forum, themed with "Let Us Soar with Integrity", was held in Commercial Aircraft Corporation of China, Ltd. (COMAC) on September 17th, 2018, in order to thoroughly implement President Xi Jinping's call for building "the Belt and Road Initiative" into an initiative of integrity and as one of COMAC's serial activities of "Six Ones" during the "Party Anti-corruption Warning and Education Week". More than ten leaders and experts from the civil aircraft industrial chain focused on the civil aircraft industrial chain and developed in-depth discussion and exchanges on the key content such as enterprise sincerity, integrity and compliance, and risk control. Mr. Zhao Jiufang, Member of Standing Committee of the Party Committee and Secretary of the Commission for Discipline Inspection of COMAC, presided over the forum and made a speech. Mr. Guo Bozhi, Member of Standing Committee of the Party Committee and Vice President of COMAC, made a keynote speech. Relevant leaders of Bureau of Policies, Laws and Regulations of State-Owned Assets Supervision and Administration (SASAC), attended the forum and made instructions. Mr. Ding Jihua, Director of the Research and Consulting Department of Beijing New Century Academy on Transnational Corporations (NATC), was invited to give a lecture. Mr. Zhao Jiufang expressed that COMAC had attached great importance to improving Party conduct and ensuring clean government as well as compliance construction, been committed to building an incorruptible COMAC, promoted the development of a compliance system, and explored to establish a large supervisory system which is directed by the Party Committee, coordinated by the Commission for Discipline Inspection, and is all-inclusive, authoritative and efficient. Mr. Zhao Jiufang put forward three proposals on deepening the implementation of the forum achievements: first, we should make joint efforts and worked hand in hand to jointly create a new atmosphere for compliance and cooperation and achieve the common pursuit of "doing a deed without mishap"; second, we should exchange ideas, learn from each other and share risks to constantly enrich new means for compliance and cooperation and innovatively promote the cooperation and compliance work in the civil aircraft industrial chain; third, we should cooperate to achieve a win-win situation, deepen and expand the working mechanism of "double ensuring and jointly building", boost in building "the Belt and Road Initiative" into an initiative of integrity, build a good corporate image and international image, and promote the healthy development of the company. Mr. Guo Bozhi shared, in his keynote speech themed with Achieve Win-Win Situation by Cooperation and Promote Development by Standardization to Lead the Road of Cooperation and Compliance for Sino-Russian Long-Range Widebody Aircraft by “Double Ensuring and Jointly Building”, the experience of CR929 project in "double ensuring and jointly building" from three aspects: establishing mechanisms to explore the working mode of preventing corruption jointly by Chinese and foreign enterprises; emphasizing education to allow the requirement of integrity be internalized in minds and externalized in acts; and focusing on implementation to make the requirement of "double ensuring and jointly building" strike root in grassroots party branches. He expressed that COMAC would continue to deepen and expand the working mechanism of "double ensuring and jointly building", strengthen exchanges with foreign partners, learn experience and practice, deepen trust and cooperation, strive to explore an internationalized, demonstrative and referential working mode of preventing corruption jointly by Chinese and foreign enterprises in civil aircraft industrial chain. "Enhancing the awareness of compliance in operation is the premise for enterprises to 'go out'. Practical experience shows that the first problem faced by Chinese enterprises when they go out is often the problem of compliance system and compliance construction." Mr. Ding Jihua made an in-depth exposition in his speech themed with Work Together to Strengthen Compliance and Build a Solid Civil Aircraft Industrial Chain from the aspects of the significance of strengthening compliance, constructing an effective compliance management system, and strengthening compliance together with the industrial chain, in combination with a number of cases. During the themed speech session, domestic and foreign experts from the civil aircraft industrial chain shared experience and communicated with each other centering on the theme of "Let Us Soar with Integrity" in combination with the actual situation of compliance construction of their own companies. Mr. Zhang Haiyong, Deputy Secretary of the Commission for Discipline Inspection and General Manager of Discipline Inspection Department of COMAC, made some observations in his speech themed with Perfect Compliance System and Build Incorruptible COMAC to Provide Strong Guarantee for China-Made Aircraft Industry from the aspects of understanding of the importance and urgency of compliance management, exploration and practice of COMAC, and some thoughts on perfecting COMAC compliance management system, and put forward four measures including strengthening the prevention and control of overseas compliance risk, deepening and expanding the working mechanism of "double ensuring and jointly building", paying great attention to the compliance management of scientific research outsourcing, and exploring the compliance behavior management of overseas talents. Mr. Fiedler, General Manager of Program Management Department of China-Russia Commercial Aircraft International Co., Ltd (CRAIC), introduced the progress of CRAIC in deepening the ideological understanding to ensure employees incorruptible and safe, strengthening the system construction to ensure the company's compliance in operation, and elaborating the work measures to ensure the project's compliance in research and development. "Executives of GE Aviation often spend about five minutes at each regular meeting talking about compliance." said Mdm Xu Yanhua, Compliance Inspector of Aviage Systems, who introduced the practices of GE Aviation and Aviage Systems in compliance construction and sincerity culture. She said: "In addition to a sound compliance system and sincerity system, leadership and executive force are essential." Mr. Chen Zhihong, Director of Audit Department of BOC Aviation Pte. Ltd., and Mr. Huang Yingyao, Deputy Director of Risk Management Department of BOC Aviation, respectively introduced the organization structure and working process of BOC Aviation in risk management, compliance and anti-corruption, internal audit management, etc., and made in-depth analysis in combination with cases. Mdm Zhang Jieyin, Chief Risk Officer of China Aircraft Leasing Company Limited (CALC), mainly introduced the "three defense lines" for the corporate governance of CALC, that is, business process control points, risk and compliance, and internal audit, in her speech themed with Let Us Soar with Integrity. Mr. Xu Dengming, Deputy Secretary of Party Committee and Secretary of the Commission for Discipline Inspection of Chengdu Airlines, introduced the practices and achievements made by Chengdu Airlines in operation management system, safety management system, quality management system and governance supervision system in his speech themed with Strengthen Compliance Management and Build Incorruptible Chengdu Airlines. He emphasized that Chengdu Airlines would always ensure compliance in operation, safety, quality and anti-corruption with the iron system, iron discipline and iron work style, and fulfill the responsibility of ARJ21 demonstration operation. Mr. Yan Kerong, Deputy General Manager of Legal Department of COMAC, introduced the development of legal compliance of COMAC. He expressed that COMAC would follow the policies set by the central government to further implement the requirements of legal compliance management; fully respect and attach importance to the rules and strive to build a legal compliance system that meets international requirements; and promote the cadres and workers to enhance the awareness of compliance and deeply understand the importance and value of compliance management. Leaders of relevant departments of COMAC headquarters, secretary of the commission for discipline inspection of each unit, and all cadres and workers of the discipline inspection and legal departments of COMAC attended the forum.